Magnetic resonance (MR) arthrography was first introduced to the musculoskeletal community in 1987 with a cadaveric study ofseveral joints including the shoulder.1 Several years later, Palmer et al. explored the clinical relevance of MR arthrography in the diagnosis of rotator cuff and labral injuries about the shoulder.2,3 The years that followed gave way to numerous studies that further refined the techniques and indications for MR arthrography. Today, MR arthrography is widely utilized and considered by most musculoskeletal radiologists and orthopedists to be an integral part of their clinical practice. Practically any joint that can be accessed by a needle can be imaged using MR arthrography. This article will focus on the most commonly imaged joints: the shoulder, elbow, wrist, hip, knee and ankle. 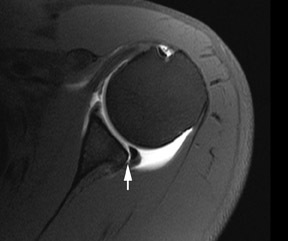 MR arthrography of the shoulder has proven to be the gold standard imaging technique for evaluation of shoulder joint pathology and can be particularly useful for evaluation of labroligamentous abnormalities.4 The advantages of MR arthrography are particularly evident when evaluating acute pathology in younger, active patients with relatively little degenerative joint disease. Full thickness tears of the rotator cuff are defined as tears with defects extending completely through the tendon. This allows communication between the glenohumeral joint and the overlying subacromial/subdeltoid bursa (Figure1).4 Partial thickness tears of the rotator cuff involve either the articular or bursal surface and do not extend completely through the tendon and do not allow communication between the glenohumeral joint and the overlying subacromial/subdeltoid bursa (Figure2).4 MR arthrography can be very helpful for articular surface tears of the rotator cuff and typically demonstrates linear contrast, tracking into the substance of the tendon. Bursal surface tears do not communicate with the joint space and therefore will not contain contrast. Detection of bursal surface tears is typically best with conventional fluid-sensitive sequences and will show fluid signal within the defects rather than contrast. 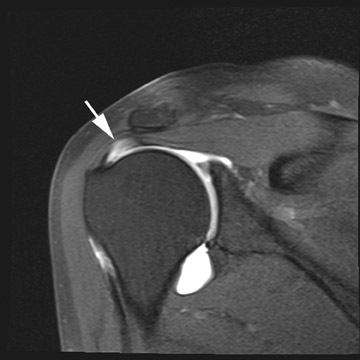 MR arthrography is particularly helpful in diagnosing tears of the glenoid labrum. Superior labral tears are often referred to as SLAP (superior labrum anterior to posterior) tears, referring to the direction from which these tears tend to propagate: anterior to posterior.5 Superior tears are most common and demonstrate 2 characteristics that are important for diagnosis. 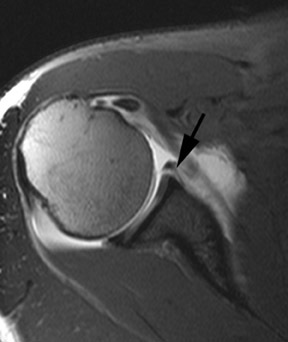 First, contrast within a SLAP tear is directed away from the interface between the fibrocartilaginous labrum and the osseous glenoid (Figure3). Signal abnormalities that appear parallel to this interface more commonly represent a superior bicipitolabral sulcus, which is a normal anatomic variant (Figure4).6 Second, abnormal signal and contrast delineating a labral tear typically has a globular contour (Figure 5). This is in contrast to the sharply delineated contour seen with the superior bicipitolabral sulcus. MR arthrography can also be critical when evaluating the anterior labrum in the setting of traumatic anterior shoulder instability. Common injuries include Bankart lesions (cartilaginous and osseous), Perthes lesions and anterior labral periosteal sleeve avulsions (ALPSA). Distinguishing between these entities can be facilitated by the addition of intra-articular contrast with MR arthrography. Elbow arthrography was first described by Lindblom in 1952 and later refined by Arvidsson and Johansson into the technique most commonly used today.12,13 In 1995, Schwartz et al. 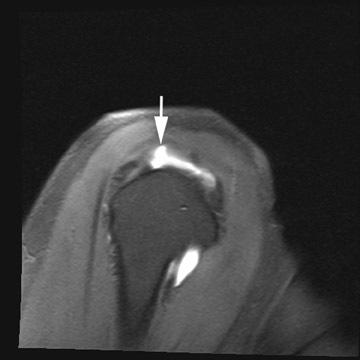 suggested that MR arthrography of the elbow provided an advantage in diagnosing collateral ligament injuries in throwing athletes.14 Several studies since then have supported this suggestion but failed to identify additional advantages of MR arthrography over conventional MR imaging of the elbow. 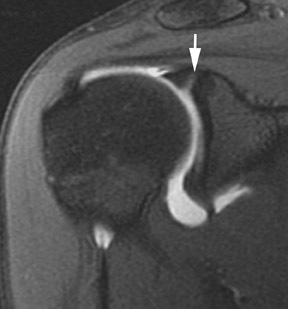 Current indications for elbow MR arthrography include evaluation of the ligamentous structures and depiction of articular hyaline cartilage defects. MR arthrography can also be useful to delineate loose bodies and synovial proliferative processes about the elbow. 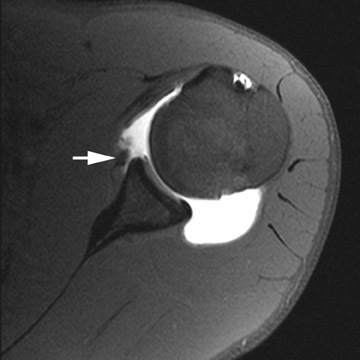 The anterior bundle of the medial collateral ligament (MCL) is the primary constraint to valgus stress on the elbow. 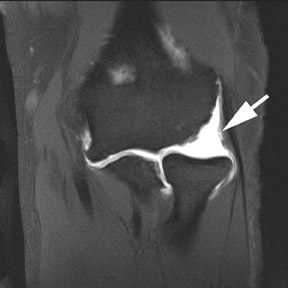 The insertion is contiguous with the sublime tubercle of the coronoid process; any fluid signal or contrast seen between the distal fibers of the anterior band of the medial collateral ligament and the sublime tubercle should be considered abnormal.15 Partial tears of the anterior band of the MCL are best seen in the coronal plane and are characterized by linear contrast extending into the ligament or contrast tracking between the ligament and sublime tubercle (Figure11). The latter pattern can often demonstrate the “T sign” which has a high sensitivity and specificity for MCL injury.16 Complete tears of the MCL will demonstrate discontinuity of the MCL complex and extra-articular leakage of contrast into adjacent soft tissues. The lateral collateral ligamentous complex consists of the radial collateral ligament, the lateral ulnar collateral ligament, the accessory lateral collateral ligament, and the annular ligament.15 Complete ligament tears demonstrate discontinuity of fibers and extracapsular contrast (Figure 12). Complete tears of the lateral ulnar collateral ligament are commonly seen in conjunction with tears of the common extensor tendons in patients with advanced injuries. Both the radial collateral ligament and lateral ulnar collateral ligament play important roles in preventing posterolateral rotational instability and either, or both, may be torn with this clinical presentation. Since the initial description by Kessler and Silberman in 1961, wrist arthrography has evolved significantly.17 Over the years, various manuscripts have advocated triple-compartment injections, bilateral injections, and have examined potential advantages of CT and MR arthrography over conventional arthrography. In 1991, Manaster reported that triple-compartment injections were more expensive, time-consuming and uncomfortable for the patient,while providing little advantage over single-compartment radiocarpal injections performed with adequate distention and digital subtraction.18 A report by Schweitzer in 1992 concluded that while MR arthrography was the most accurate method for diagnosing scapholunate, lunotriquetral, and triangular fibrocartilage complex(TFCC)tears, the slight aggregate improvement in accuracy over conventional MR imaging probably did not justify the invasive technique.19 Today, there remains no real consensus on optimal technique or indications for wrist arthrography. MR arthrography can be very useful for evaluating the triangular fibrocartilage complex (TFCC). 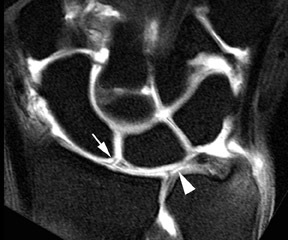 Numerous studies have documented the high incidence of asymptomatic and congenital perforations of the TFCC, and have called into question the significance of fluid communication across the TFCC between the radiocarpal joint and inferior radioulnar compartment.21 MR arthrography provides direct visualization of the morphology of the TFCC and associated pathology, as well as demonstration of contrast traversing the TFCC through the tear. 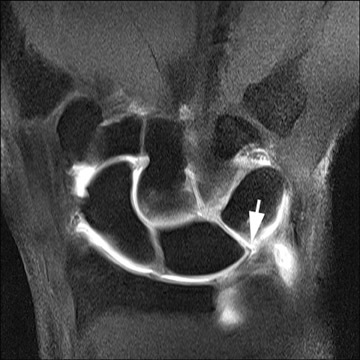 The TFCC is comprised of several structures including a biconcave articular disc that is contiguous with the articular surface of the distal radius.22 Strong ligamentous attachments between the distal radius, ulnar styloid and carpal bones stabilize the distal radioulnar and ulnocarpal joints and are prone to both traumatic and degenerative injuries. 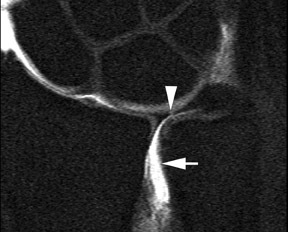 Contrast extending across the articular disc is a common finding and indicative of TFCC tear in the symptomatic wrist (Figure 15). Tears at the ulnar aspect of the TFCC, as well as the radial attachments,tend to occur in younger patients and are more often traumatic in nature. These injuries are typically amenable to arthroscopic repair.23 Central perforations of the TFCC tend to be more common in older patients and tend to be degenerative and less amenable to surgical repair. MR arthrography of the hip was first described by Hodler et al. 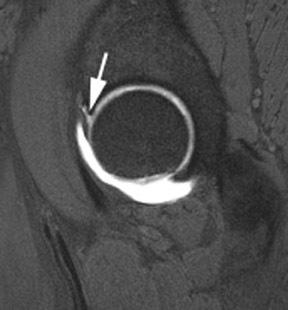 in 1995 and was shown to better depict the acetabular labrum than conventional MR imaging.24 Subsequent publications confirmed the advantages of MR arthrography in patients with chronic hip pain; particularly when labral tears, femoroacetabular impingement, or articular cartilage defects were suspected. 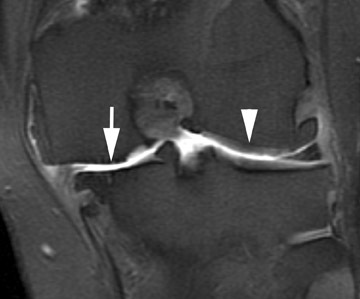 Unlike SLAP tears in the shoulder, tears of the acetabular labrum are more commonly seen as contrast tracking between the fibrocartilaginous labrum and the acetabular rim (Figure 16), rather than tracking into the substance of the labrum itself.25 The presence of normal clefts in the labrum is somewhat controversial. Location and depth of contrast-filled defects are important considerations when distinguishing between normal labral clefts and pathologic tears. Full-length defects that occur at the anterosuperior portion of the labrum (11 o’clock) are more likely to represent tears. There is some controversy as to the existence of acetabular labral clefts. Many believe that defects at the posteroinferior portion of the labrum (8 o’clock position) which do not extend the full length of the labroacetabular interface may represent clefts.26 Associated perilabral pathology, such as paralabral cysts, strongly favors a tear as well. MR arthrography of the ankle was first introduced in 1992 by Mayer et al. 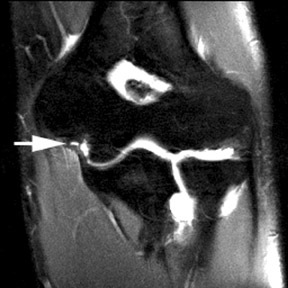 and has been shown to be superior to conventional MR imaging and stress radiographs for the evaluation of lateral ligamentous complex injuries.32 Although most of these injuries are self-limiting, it has been estimated that 10% to 20% are not, and chronic instability can ensue.33 For these patients, MR arthrography may prove beneficial for grading lateral ligamentous injuries, thereby determining if surgery is indicated. 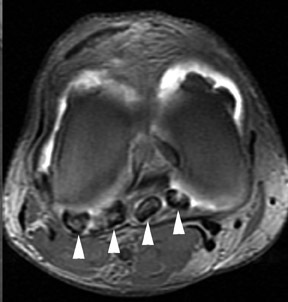 The anterior talofibular (ATFL) and calcaneofibular ligaments are clearly identified on axial and coronal images (Figure 22). The ATFL is typically the first to tear with inversion injuries and should be evaluated initially. Injuries of the remaining lateral ligamentous structures are unusual in the absence of a co-existing injury of the ATFL. Lower-grade tears will demonstrate abnormal signal without extra-articular contrast. Grade-3 and higher tears will demonstrate ill-defined contrast tracking into the adjacent soft tissues and either a wavy or torn ATFL, and/or absence of visualization of the ligament (Figure 23). MR arthrography has evolved over the years to become an invaluable tool for diagnosing a wide variety of pathologic processes in joints throughout the body.It continues to prove its superiority to conventional MR imaging for a growing number of indications and, with further research and refinement of techniques, this trend is likely to continue. Hajek PC, Baker LL, Sartoris DJ, et al. MR arthrography: Anatomic-pathologic investigation. Radiology. 1987;163:141-147. Palmer WE, Brown JH, Rosenthal DI. 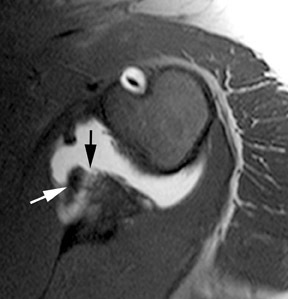 Rotator cuff: Evaluation with fat-suppressed MR arthrography. Radiology. 1993;188:683–687. Palmer WE, Brown JH, Rosenthal DI. 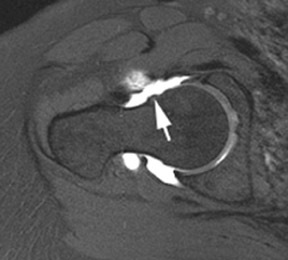 Labral-ligamentous complex of the shoulder: Evaluation with MR arthrography. Radiology. 1994;190: 645–651. Peterson JJ. Shoulder Injections. Peterson JJ,Fenton DS, Czervionke LF eds.Image-Guided Musculoskeletal Interventions. 1st ed. Philadelphia, Pa: Saunders Elsevier;2008:9-40. Snyder S, Karzel RP, Del Pizzo W, et al. SLAP lesions of the shoulder. Arthroscopy. 1990;6:274-279. Tuite MJ, Cirillo RL, De Smet AA, et al. Superior labrum anterior-posterior (SLAP) tears: Evaluation of three MR signs on T2 weighted images. Radiology. 2000;215:841-845. Waldt S, Burkart A, Imhoff AB, et al. Anterior shoulder instability: Accuracy of MR arthrography in the classification of anteroinferior labroligamentous injuries. Radiology. 2005;237:578-583. Wischer TK, Bredella MA, Genant HK, et al.Perthes lesion (a variant of the Bankart lesion): MR imaging and MR arthrographic findings with surgical correlation.AJR Am J Roentgenol. 2002;178:233-237. Neviaser TJ. 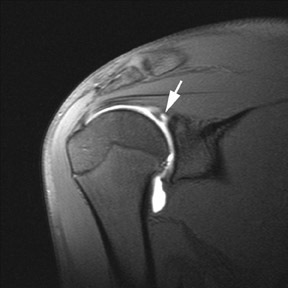 The anterior labroligamentous periosteal sleeve avulsion lesion: A cause of anterior instability of the shoulder.Arthroscopy. 1993; 9:17–21. Stoller DW.Chapter 8. Magnetic Resonance Imaging in Orthopedics and Sports Medicine. 3rded. Baltimore, Md. : Lippincott Williams & Wilkins; 2006:1353. Tung GA, Hou DD. 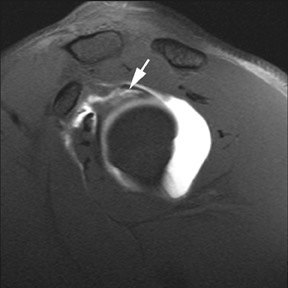 MR arthrography of the posterior labrocapsular complex: Relationship with glenohumeral joint alignment and clinical posterior instability.AJR Am J Roentgenol. 2003;180: 369–375. Lindblom K. Arthrography. J Fac Radiol. 1952; 3:151–63. Arvidsson H, Johansson O. Arthrography of the elbow-joint. Acta Radiol. 1955;43:445–452. Schwartz ML, al-Zahrani S, Morwessel RM, et al. 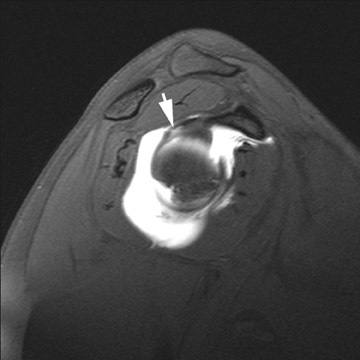 Ulnar collateral ligament injury in the throwing athlete: Evaluation with saline-enhanced MR arthrography. Radiology. 1995;197:297–299. Peterson JJ. Elbow Injections. In: Peterson JJ,Fenton DS, Czervionke LF eds. Image-Guided Musculoskeletal Interventions. 1st ed. Philadelphia, Pa: Saunders Elsevier;2008:43-58. 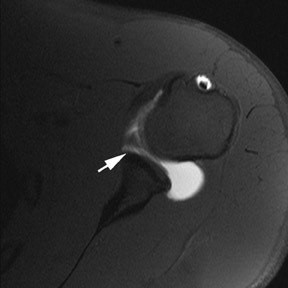 Timmerman LA, Schwartz ML, Andrews JR.Preoperative evaluation of the ulnar collateral ligament by magnetic resonance imaging and computed tomography arthrography: Evaluation in 25 baseball players with surgical confirmation. Am J Sports Med. 1994;22:26–31. Kessler I, Silberman Z. An experimental study of the radiocarpal joint by arthrography. Surg Gynecol Obstet. 1961;112:33–44. Manaster BJ. The clinical efficacy of triple-injection wrist arthrography. Radiology. 1991;178:267–270. Schweitzer ME, Brahme SK, Hodler J, et al. Chronic wrist pain: Spin-echo and short tau inversion recovery MR imaging and conventional and MR arthrography. Radiology.1992;182:205–211. Erratum in: Radiology. 1992;184:583. Scheck RJ, Kubitzek C, Hierner R, Szeimies R, et al. The scapholunate interosseous ligament in MR arthrography of the wrist: Correlation with non-enhanced MRI and wrist arthroscopy. Skeletal Radiol. 1997;26:263-271. Stoller DW. 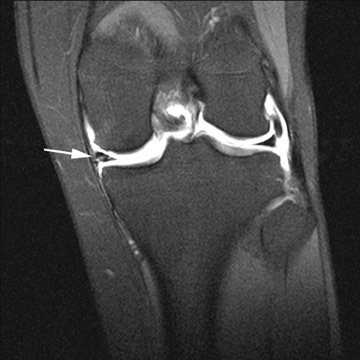 Magnetic Resonance Imaging in Orthopedics and Sports Medicine. 3rded. Baltimore, Md. : Lippincott Williams & Wilkins; 2006: 1721-1749. Totterman SM, Miller RJ. 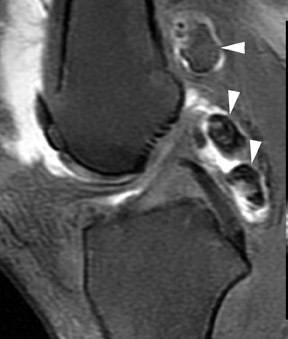 Triangular fibrocartilage complex: Normal appearance on coronal three-dimensional gradient-recalled-echo MR images. Radiology. 1995;195:521-527. Ruegger C, Schmid MR, Pfirrmann CW, et al. 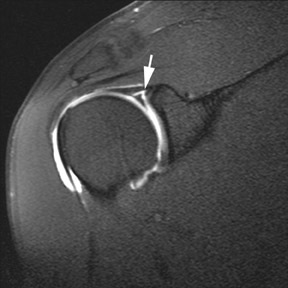 Peripheral tear of the triangular fibrocartilage: Depiction with MR arthrography of the distal radioulnar joint. AJR Am J Roentgenol. 2007;188:187-192. Hodler J, Yu JS, Goodwin D, et al. MR arthrography of the hip: Improved imaging of the acetabular labrum with histologic correlation in cadavers. AJR Am J Roentgenol. 1995;165:887–891. Erratum in: AJR Am J Roentgenol. 1996;167:282. Petersilge CA, Haque MA, Petersilge WJ, et al. Acetabular labral tears: Evaluation with MR arthrography. Radiology. 1996;200:231-235. Studler U, Kalberer F, Leuniq M, et al. MR athrography of the hip: Differentiation between an anterior sublabral recess as a normal variant and a labral tear. Radiology.2008;249:947-954. Pfirrmann CW, Menglardi B, Dora C, et al. 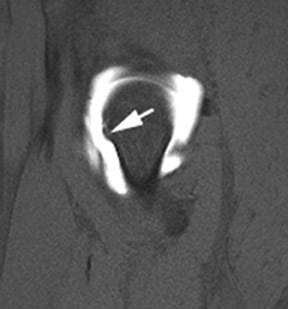 Cam and pincer femoroacetabular impingement: Characteristic MR arthrographic findings in 50 patients. Radiology. 2006;240:778-785. Erratum in: Radiology. 2007;244:626. Peterson JJ, Bancroft LW.History of arthrography.Radiol Clin North Am. 2009;47:373-386. Magee T, Shapiro M, Rodriguez J, Williams D. MR arthrography of postoperative knee: For which patients is it useful? Radiology. 2003;229:159-163. Gagliardi JA, Chung EM, Chandnani VP, et al. 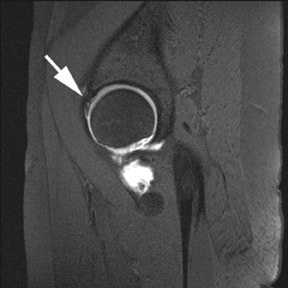 Detection and staging of chondromalacia patellae: Relative efficacies of conventional MR imaging, MR arthrography, and CTarthrography. AJR Am J Roentgenol. 1994;163:629–636. Peterson JJ. Knee Injections. In: Peterson JJ,Fenton DS, Czervionke LF eds.Image-Guided Musculoskeletal Interventions. 1st ed. Philadelphia, Pa: Saunders Elsevier;2008:111-135. Mayer DP, Jay RM, Schoenhaus H, et al. Magnetic resonance arthrography of the ankle. J Foot Surg. 1992;31:584–587. 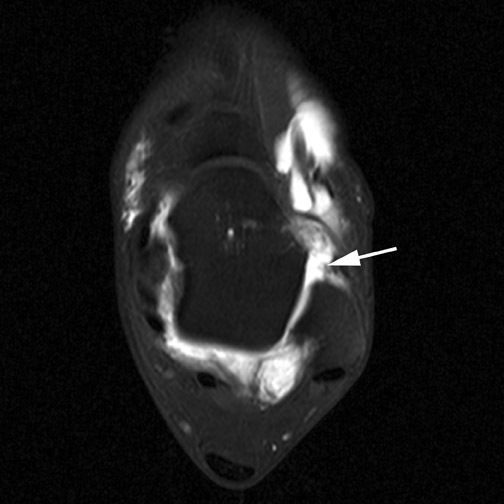 Robinson P, White LM, Salonen DC, Daniels TR, Ogilvie-Harris D. Anterolateral ankle impingement: MR arthrographic assessment of the anterolateral recess. Radiology. 2001;221:186-190.